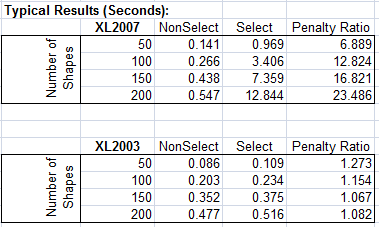 on worksheets can easily take 10 or 20 times longer in Excel 2007 than in earlier versions. Fortunately the slow code can be rewritten to achieve acceptable performance in Excel 2007.
case, there was little benefit in doing so. Enter Excel 2007. It's not clear why but this kind of code runs like a turtle in quicksand under Excel 2007. And the more shapes you're dealing with the slower it goes. This code runs about 50% slower in Excel 2007 than Excel 2003, which is equal to or better than macro performance generally. is in Excel 97-2003 format so it can be run in Excel 2007 and in earlier versions.